• Marian Rivera and Dingdong Dantes Welcome Their Second Child! AMAZING night last night where two of my favoritest things in the world came together! Food and Smart People! The well named event called Ignite, is actually a global trend similar to that of T.E.D.x or Pecha Kutcha. Still not ringing a bell? Well pretty much an Ignite event is where you can hear a bunch of speakers (in this case 12) talk about anything, from frying an egg, to starting a revolution, and everything else in between. What makes Ignite events so unique is that Ignite talks are exactly five minutes long, Ignite presenters share their personal and professional passions, using 20 slides that auto-advance every 15 seconds—whether they’re ready or not. It’s actually a perfect way to get exposed to new things! If you want to find out more, you can always talk to the speakers afterwards and also do your own research. But the 5 minute, automatic-slide-changing platform is perfect to just give the a teaser of a multiverse of topics. Now about the venue, it’s actually one of the YUMMIEST and classiest places in the Metro. The Adarna Food and Culture Restaurant! Adarna Food and Culture is a restaurant that celebrates Filipino culinary heritage by serving historical, regional and heirloom recipes in a warm, elegant and homey setting. Every table offers a special view of the place with its collection of Filipino memorabilia. Hosts are on hand to provide each guest with efficient and polite service to make dining pleasurable and worry-free. Adarna serves a selection of dishes based on the accounts of old family cooks, descendants of families with culinary traditions and old Filipino cookbooks. Try Sulu Piassok, Pancit 1913, Menestra Favorito, Bicol Express, Sigarillas Salad with Grieben, Pancit Musiko, Batanes Yellow Rice, Chicken Relleno Antigo, Adobong Batangas, Felicidad and grilled meats with Salsa Monja among other gastronomic finds. It also offers vegan options for many of its recipes and can accommodate requests for special dietary needs with prior arrangements. The restaurant commonly uses organic ingredients. It uses no MSG, artificial flavors, seasonings and preservatives. All ingredients that can be sourced locally and from their points of origin are used. Traditional cooking methods are applied in a modern kitchen that observes strict sanitary standards to ensure that the food served is safe and clean. Adarna regularly offers new dishes on its menu to celebrate the diverse culinary traditions of the country for its guests to discover and enjoy. Adarna Restaurant is actually also very famous for their Langka Shake, of which I’m a very big fan of. Unfortunately, they were sold out that night. Fortunately, their Strawberry Fruit Shake was just as delightful! 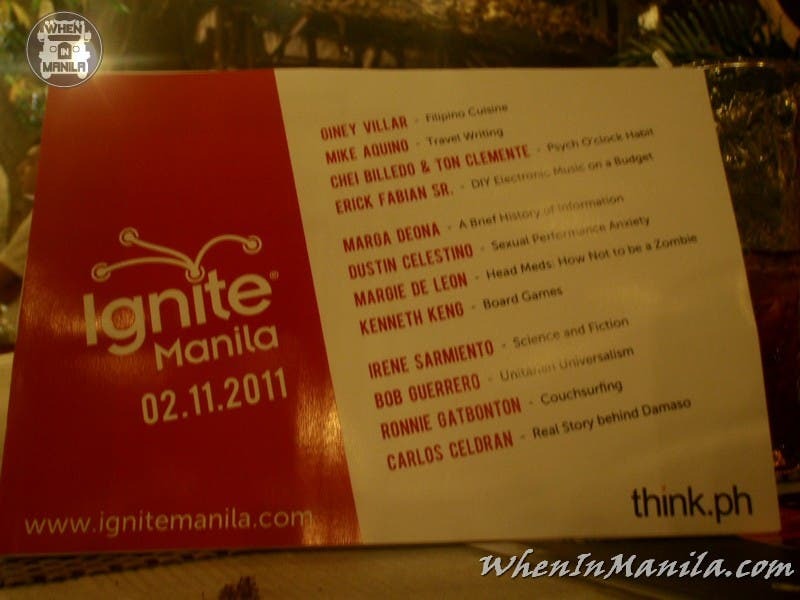 When In Manila, do check out the Ignite Manila events to get yourself an “edumacation” and learn cool new things! You also get to meet lots of great individuals who attend the Ignite Events. When In Manila, also be sure to get a taste of REALLY GOOD Filipino food at Adarna Food and Culture Restaurant. Try their fresh fruit shakes, especially the Langka Shake. I’m also a big fan of their Grilled Chicken Breast with Kesong Puti dish and the Kesong Puti Langka Fry with Mango Drizzle Dessert. Either way, you’re sure to have a gastronomic time, while feeling that sense of culture with every visit to Adarna Food and Culture Restaurant! Vince Golangco is the Founder & CEO of WhenInManila.com, where he manages thousands of contributors, writers, photographers, videographers and story tellers. Vince graduated from San Diego State University with a Bachelor’s Degree in Communication and a minor in Business. Before starting WhenInManila.com, he already had over 10 years of international experience in marketing, advertising, and creative writing. He served as an Information Systems Technician in the United States Navy, was a Marketing & Development Coordinator at the Make-A-Wish Foundation, the Senior Media Planner for Bright Box Media, was a radio DJ and hosted a tech TV show in Manila. Vince is a surfer, a skater, a writer, a US Military Veteran, an AKPsi brother, an adventure seeker and an avid storyteller. Connect with Vince on Twitter/Instagram - @VinceGolangco. The Gag Reel of “Thor: Ragnarok” is Just Too Cute! Belle de Jour Power Planner 2014, Glad to Meet You!